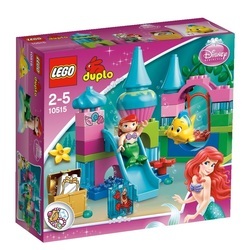 The Lego Duplo Princess Ariel Undersea Castle is one of the many buildable sets made by Lego that are based on popular movies and television shows. 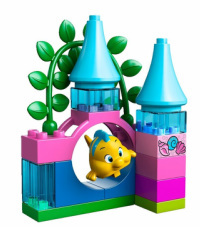 The compact design of this buildable castle is separated into two sections, making it look great for easy storage and a fun additional piece to any Disney Princess collection. 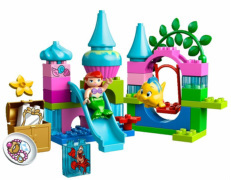 This Lego Duplo Princess Ariel Undersea Castle is a perfect addition to other Disney Princess toys your child may own. Even if your young child is not familiar with the Disney Princess, Ariel, this can still be a fun and educational toy to build and play with. The first thing that you will notice with this Lego set is how much attention to detail was taken when designing this toy. The castle is made with soft colours of light blue, light pink, and a medium shade of purple to closely resemble the peacefulness of Ariel's undersea world. There is a treasure chest to resemble the treasures that Ariel collected in the movie, as well as plastic seaweed to give your child the realistic feeling of being under the deep sea. The large pieces make it easy for little ones to build alone or with a little help from an adult. The main features that make this Lego set an interactive toy is the sliding board and swing that are attached to the castle. The castle is separated into two sections, allowing for easy of movement, play, and storage. The large pieces also make the Lego set durable for hours of enjoyable play by your young child without small pieces falling apart, which can interrupt happy play time. This set is a great start to introduce your child to the wonders of creative building with Legos, although it can be a bit pricey. This is not only a fun toy, but is an educational one as well. It also helps your child develop fine motor skills for a healthy development. 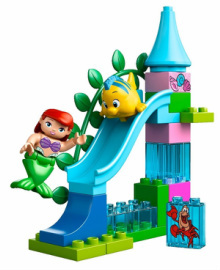 Due to the ease of building, your child may even find it fun to take apart when done and rebuild when your child wants to play with the Lego Duplo Princess Ariel Undersea Castle. Overall, this Lego set stands up to the Lego standard of high quality pieces. It is sure to give your child hours of imaginative fun with a favourite Disney Princess. It's a great toy, and definitely worth the purchase.